Totally organic and made exclusively of leaves and grass clippings. All weed seeds and pathogens are killed after going through a thermophilic process where temperatures measure between 140 - 160 degrees. This is a rich soil amendment when combined with existing soil. Improving the soil fertility helps add nutrients back into the earth as well as volume and aeration therefore improving drainage, moisture retention and improving the quality of our clay soil in the area. One of the three chipped mulches Lawn-Corps processes for a more manicured look to your landscaping. Organically dyed and processed. Colorants used are environmentally safe and non-toxic for children, pets and plants. Double ground and in its natural state, no dyes used. Cedar mulch decomposes at a slower rate, so it needs to be replenished less frequently. The resins in cedar mulch emit a pleasant scent. As with all our mulches, use as a decorative mulch or place around trees and flower beds to reduce weed growth. Will also help insulate plants in the winter and conserve moisture in the summer. Gives an earthy, more natural look to your landscaping.Shredded, double ground and organically dyed and processed. The colorants used are environmentally safe and nontoxic to children, pets and plants. This is the natural, raw version of our shredded color mulches. It is processed from assorted hardwood lumber. Double ground and totally organic, no dyes or chemicals added. Our most affordable mulch for multiple uses. Perfect for paths, trails, gardens and animal bedding. A premium topsoil blend made of 50% topsoil/50% compost. Perfect for gardens, general lawn repair, over seeding, filling in low areas or establishing a new lawn. Easy to work with, pulverized and ready for use. FOREST BROWN CHIPS $45 per cubic yard One of the three chipped mulches Lawn-Corps processes for a more manicured look to your landscaping. Organically dyed and processed. Colorants used are environmentally safe and non-toxic for children, pets and plants. Popular with commercial accounts because its rich, vibrant color is a standout. Shredded, double ground and organically dyed and processed. The colorants used are environmentally safe and nontoxic to children, pets and plants. Our top seller this year, black has become the new brown. It adds a rich and dramatic touch to your landscaping. Shredded, double ground and organically dyed and processed. The colorants used are environmentally safe and nontoxic to children, pets and plants. A great buy for the price! 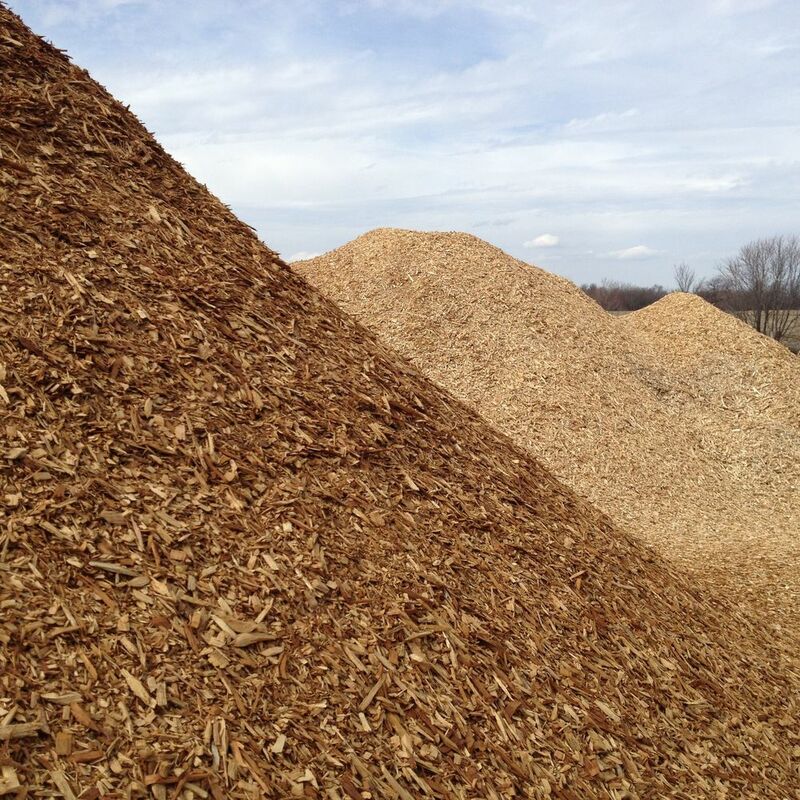 Naturally dark and rich in color and made from a variety of woods, this shredded bark holds moisture in garden beds and will break down faster than other mulches providing nutrients to the soil. Rough cut, single ground mulch, primarily used for soil erosion. Delivery is available for enriched topsoil, compost and mulch. All fees will vary throughout greater Kansas City and outlying areas. Fees are determined on the delivery location and amount of yards purchased. All Lawn-Corps Curbside Residential customers receive a discount on decorative dyed mulch, call for details. Mulches and Soil Products are also available for pick up. Monday thru Saturday 9 am - 3 pm, Open, weather permitting. Closed Sunday. Yard Waste Recycling at Reasonable Rates. Contractors, Chipper and /or Compactor Trucks welcome - 58 Hwy and Prospect, just 4 Miles South of Martin City. How much mulch, enriched topsoil or compost do I need? Click here to calculate.